The ArcHub project aims at establishing a network of excellence for sustainable mineral exploration and extraction in the Arctic. Such a Network would act as an Arctic Gateway and Forum to further strengthen synergy between research, education, governmental organizations and industry in the Arctic region/Europe promoting environmentally and socially sustainable extraction of resources. Better exploration and extraction methods that may or may not be unique to the Arctic. This requires research, innovation and implementation testing in pilot plants and will benefit from a close collaboration with an Exploration Lighthouse Programme and a High Tech Sustainable Mine Lighthouse Programme. Better treatment methods for mine waste and tailings. The sensitive Arctic environment and also fragile societies need unique solutions. Again the ARCHUB would benefit from a close collaboration with a High Tech Sustainable Mine Lighthouse Programme. Better understanding of societal issues specific to the Arctic region and a general strengthening of the licence to operate. Issues include exploitation of living resources, indigenous peoples right, permitting and legal issues, and environmental considerations. Better knowledge of where the most promising mineral resources are located in order to either direct targeted mineral exploration or manage land use plans and infrastructure investment. Key beneficiaries are many, but foremost include the people and communities in the Arctic, as they are enabled to build a responsible, sustainable industry and attract investment. The EU benefits as exploration and production of primary raw materials in Europe increases. The industry benefits by getting into dialogue with research and government to join forces towards innovation in mineral exploration (decreasing financial risk), mining and waste management (decreasing direct costs and environmental impact). Exploration and mining have an additional set of challenges when it comes to the Arctic – it is cold, it is too dark or too light, it is remote, there is permafrost, there is a lack of local skilled labour, there is extremely sensitive and vulnerable environment. All of these challenges are challenges for mineral and metallurgical processes as well. Methods developed for exploration, extraction, environmental mitigation and protection in the Arctic require innovative world-class technology, which will be easily transferable to other environments and help ensure best practices wherever we extract our primary resources. The ArcHub project will thus address several of the six knowledge and innovation themes, most importantly, exploration and raw material resource assessment, mining in challenging environments and increased resource efficiency in mineral and metallurgical processes. 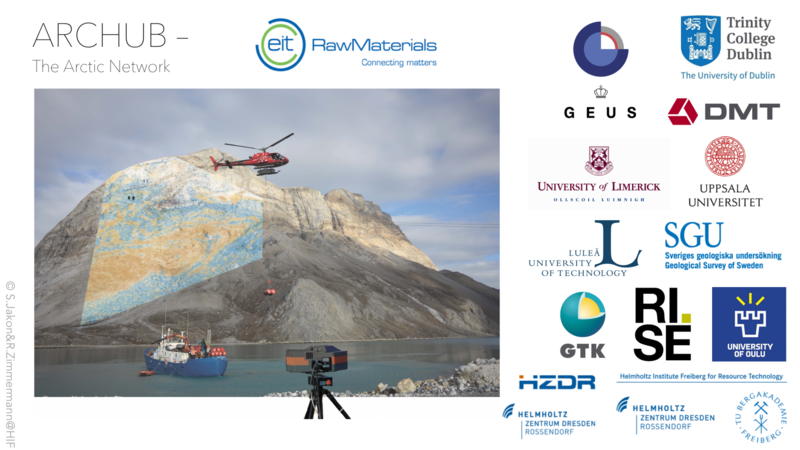 This project will build up the community of Arctic exploration and mining in the EIT RawMaterials with strong leverage to other activities having the potential to bringing the EIT RawMaterials partners to the forefront of innovation in this field. The focus on the Arctic has the potential of increasing the number of critical raw material resources, SMEs, creation of new jobs, research innovation and investment in pilot plants or infrastructure. The ArcHub project will thus establish a network across the knowledge triangle by establishing a platform for business, research and higher education addressing the diversity of challenges in the Arctic with a great potential for significant innovation. A key success factor on a short-term is a better appreciation of stakeholders in government, academia and industry, resulting in common understanding and jointly targeted research in developing a responsible and sustainable Arctic minerals industry. Another important success criterion is regular submittal of research proposals and sustainable dissemination of results amongst the stakeholders. This is ensured by the regular workshops and controlled by presentation and education and training programs.In the longer term, an increase in exploration expenditures and exploration success rates is the expected outcome, and in the even longer term, an increase in primary raw materials production in the European Arctic, including Greenland will define the success of this project.